I have been a professional automotive photographer for 12 years. My work takes me all over the UK and Europe, and I need a vehicle that will safely, reliably and comfortably transport myself, my equipment, and sometimes clients to any location, on- or off-road, whatever the conditions. Considering these broad demands, it is no wonder that many different vehicles have tried and failed to meet my requirements. Until, that is, I opted for this 2013 Toyota Hilux Invincible with the powerful 3.0-litre D-4D engine and five-speed automatic transmission. Over the past year and 28,000 miles the Hilux has repeatedly astounded me by its sheer capability and adaptability. It has accompanied me on countless assignments across Britain, taken myself, my wife and our two dogs across Europe with our mountain bikes and snowboards in temperatures from -20 to 39 degrees centigrade, and made the task of taking my motorbike to enduro events in Wales and Belgium effortless. 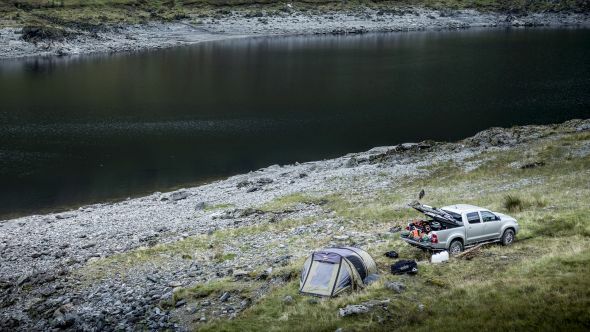 Most recently, my wife and I took the Hilux on a week-long wild camping excursion through the Highlands of Scotland. Once again, the truck impressed not only with its reliability and off-road capabilities – reaching out-of-the-way places other vehicles dare not try – but also with its comfort and ability to effortlessly perform a wide variety of tasks. The Hilux has been mildly adapted for how we use it, beginning on the inside with full rubber floor mats and waterproof seat covers. A waterproof BedRug load liner is fitted to protect the pick-up bed, while a Mountain Top aluminium tonneau cover secures the luggage and features sports bars either side. These bars are equipped with a Thule luggage basket and cross bars for carrying bulky items such as mountain bikes and water containers. The motorcycle, however, is carried on a rack attached to an ARB rear step tow bumper. Thanks to a four-wheel drive system that has been proven in expeditions to both Poles, the only modification I have carried out on the chassis relates to the tyres. The original 17″ alloy wheels now run General Grabber all-terrain rubber, which offers a good compromise between on- and off-road ability in all seasons and was instrumental in getting us to the locations you see in these pictures. See more: Phil Steinhardt is a regular photographic contributor to this blog, having been commissioned to capture stunning images of many models in the Toyota range. Click on the following links to see his work on the iQ, Yaris, Auris, Verso, Avensis and Prius Plug-in. Click the following link to visit Phil’s Facebook page. Further information about the Hilux range is available on the designated section of the Toyota UK website. 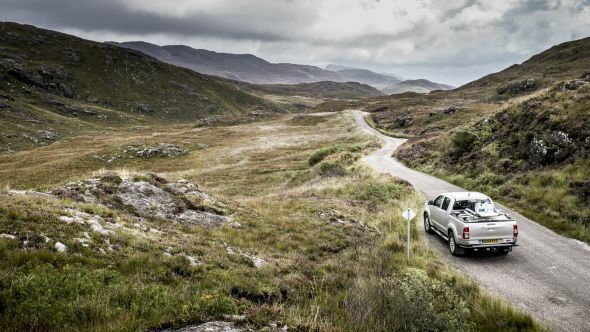 If you would like to test drive a Hilux, leave a comment below and we’ll be in touch shortly.